One UI replaces the Samsung Experience as Samsung’s custom interface for Android. It's simplified, uncluttered, and designed to show only essential information and reduce distractions. 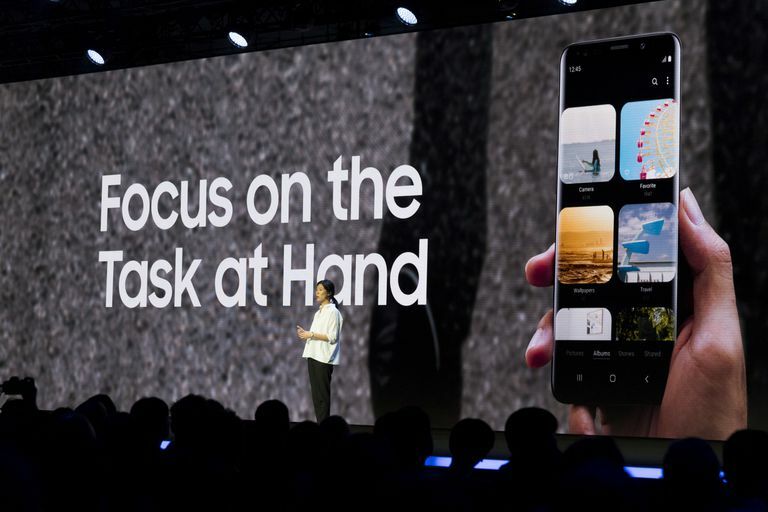 Samsung's user experience is especially helpful for larger screens and one-handed use, which makes sense, as the company popularized the phablet with its Note series. The goal is to minimize the issues that come with being glued to our smartphone screens including joint pain and eye strain. The One UI custom skin entered beta in November 2018, and in January 2019 started rolling out to newer Galaxy smartphones, including the S8/S8+, S9/S9+, and Note 9. Our smartphones come with many side effects, including ergonomic issues like texting thumb and repetitive stress. One UI is designed to alleviate this, as many people use (or try to use) their phones with one hand, which can get dicey. Samsung splits the screen in many of its apps, such as Messages, putting content at the top of the screen, and buttons at the bottom within easy reach of your thumb. This way, people don't stretch their thumbs uncomfortably or shuffle the phone in their hand, which can result in dropping it and cracking the screen. The Clock app, for example, shows how long it will be before the next alarm goes off, while you can manage your alarms with controls at the bottom. Also, in the viewing area at the top, you’ll see larger text. For big phones like the Galaxy Note 9, this layout is much easier on the hands. This split-screen approach will also work well with the company’s forthcoming foldable phone, with actionable items on one side and view-only content on the other. One UI is also designed to be more comfortable on the eyes, with vivid colors and a rounded design for app icons and other elements. Another goal for Samsung was reducing distractions, which of course, is another side-effect of our increased screen time. One element is called Focus Blocks, which groups together related settings, for example, to make it easier and faster to navigate. In the Gallery app, this translates to larger album thumbnails. One UI also has a dark mode that’s consistent across apps, so you’re not kept awake by the phone’s brightly lit screen. The fastest way to get One UI is to acquire a Samsung Galaxy S9, S9+, or the Note 9. You’ll also need a Samsung account, which is part of the phone set-up process. If you don’t already have an account, create one by going to Menu > Settings > Accounts > Add account > Samsung account > create new account. Next, launch Galaxy Apps or the Google Play Store and download the Samsung Members app. Log in, then go to Notices > One UI Beta Program Registration to submit an application. After you sign up, go to Settings > Update Software, then tap Download Updates Manually. The software will then update and load the beta version. Once One UI is out of beta, you’ll be able to upgrade your software to the final version.